Waterlilies fortunately have few pests and diseases that afflict them but one that can be a seasonal or constant problem, depending on where you live, is caterpillars. 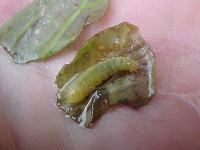 The ones that attack waterlilies are the larvae of the China Mark Moth. These pests are known as "sandwich men" or "taco men" because they often cut pieces of pads and attach themselves between two layers, to hide while they ravage leaves and to float from pad to pad. In cooler climates, the caterpillars are only present spring and fall. In warm climates they can be a year-round problem. The damage done by the caterpillars can be in several forms, the most obvious of which is rounded pieces cut out of pads. Infant larvae can be harder to spot, in fact almost invisible for a time. 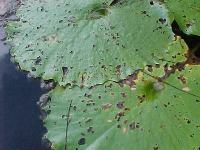 They can make tiny holes in the pads or a lacelike tracery that mimics other problems like fungus. At this stage they may not make sandwiches but will get between pads and stick them together. If they do make sandwiches, they are tiny and usually near the cut they have made, often at the edges of the pads. As they grow larger, caterpillars can be most often found around the under edges of pads and in the center of pads where the stem attaches. 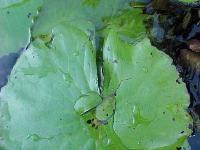 They can also be found attached to stems several inches under water. 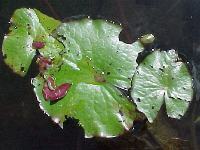 In ponds with several varieties of waterlily, they will attack the softer leaved varieties first. Control can be as simple as hand picking them off. 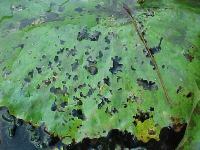 A better answer for most pond keepers is to spray or sprinkle BT (Bacillus thuringiensis) on the pads. This is an all-natural control, completely harmless to anything but caterpillars. This bacillus paralyzes the intestinal tract of the larvae and they disappear in five to seven days. There are several strains of BT (Berliner is the best against the waterlily caterpillar) available at most garden centers. Because BT is alive, it should be as fresh as possible and stored in a cool place. We personally apply BT brand name Thuricide with a hand spray bottle and mix it extra strong since we are spraying into water which will further dilute it. We spray either early in the morning or late in the afternoon since BT's effectiveness is weakened by exposure to sun and heat. Remember not to expect to see results immediately - it will take several days. As mentioned above, in cooler climates caterpillars are seasonal but can plague growers in warm climates all year. BT has no residual effect so repeat spraying is indicted at the first sign of new infestation. 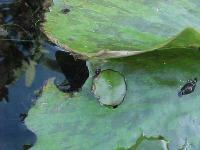 Pond snails often get the blame for the damage done by caterpillars since they can be found in the damaged areas as they begin to decay. Other pond inhabitants sometimes take the rap. 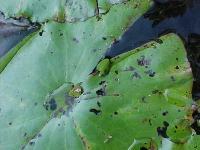 Be sure to look for larvae before you try to kill off other creatures that may be beneficial to your pond!